What is Heiankyo you may ask? You may know of the Heian Period which began in 794 and lasted til 1185, Heiankyo is the city built as the capital of Japan we know today as Kyoto. In 784 Emperor Kammu decided to move the capital away from Nara to escape the powerful monks that were threatening his rule. The first stop was at Nagaoka but soon moved again to Kyoto in 794. The Imperial court remained in Kyoto until 1868, then was moved to the newly established capital of Tokyo. The Heian Period is known as the period of court aristocracy, art, literature, strongly developed customs and decorum. 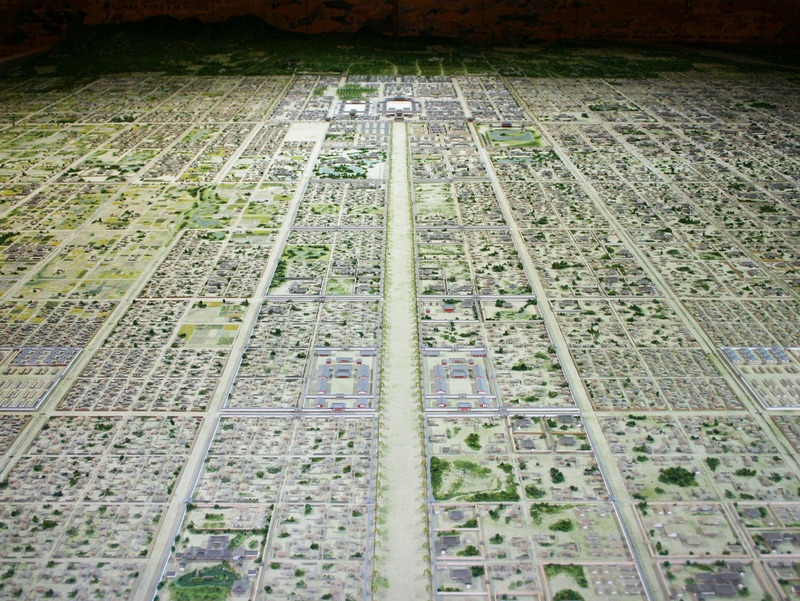 Heiankyo was modelled after Nara which itself was modelled after the Tang capital in China. But Heiankyo was built with size in mind. It was huge, relative to the period that is. North to south was about 4 km and east to west was about 3km. The current Heian Temple sits in the approximate site of the ancient capital. The Heian period also witnessed the rise of the Fujiwara clan. Over a number of decades the Fujiwara slowly gained power through intermarriage into the court, filling important government positions and buying up tax free land. The peak of Fujiwara power was seen during 966 to 1027 under Michinaga who dominated the Heian court for about 30 years. Four of his daughters became imperial consorts and two of their sons became Emperors as well as one of Michinaga’s grandsons. With all of their power the Fujiwara’s lived in luxury and extravagance while the common people lived in poverty. The famous Japanese literary piece “The Tale of Genji” documents life in the court and life in Heian times. Heian period aristocrats were extremely snobby, status conscious and birth right was everything. From the time a person was born they were already placed in a social rank. From his/her rank they could then occupy certain positions within the court and government. Commoners were looked down of to the point of being subhuman, nowhere to be seen inside this fantasy world. The Japanese language is famous for being polite and its many levels of politeness when speaking to ones elders and superiors. We can grant the Heian period for this. Heian politeness between powerful, educated aristocrats was above all the most important feature which separates one from of being an aristocrat and a filthy commoner. Towards the end of the Heian period another clan based in the east began to put pressure on the Fujiwara. The Fujiwara suffered from years of internal strife and the growth of the Shonen, who were rural governors and who had been able to build up their own military powers which would eventually become the samurai class. The Fujiwara military was weak so the court called upon the governors to help with uprisings but these allies eventually turned on the Fujiwara court. One of the families the Fujiwara called upon was the Taira. The Genpei war in 1180-1184 was the finale in a series of rebellions and saw the end of the Heian Period and the loss of power for Heiankyo. A family in the east, the Minamoto clan defeated the Taira, who had succeeded the Fujiwara in the imperial court, moved the capital to Kamakura. The city was renamed Kyoto at the end of the Heian Period. Unfortunately during the Onin War of 1467-77 Kyoto was destroyed including the grand buildings of the old imperial court. By the time Toyotomi Hideyoshi rebuilt Kyoto in the 16th Century much of the land where the old Heiankyo city occupied had been built over. 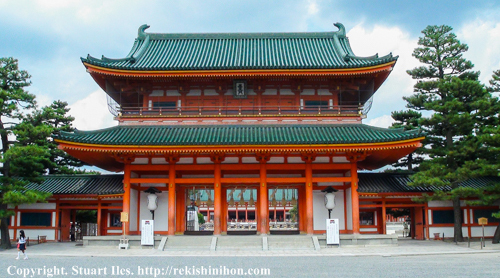 Luckily for us today the current Heian Temple was built in 1895 to commemorate the 1100th anniversary of the establishment of the Heiankyo court. The temple sits on part of the site of the first capital of Japan. Reblogged this on Rekishi Nihon (Japanese history). Next Post Why didn’t Japanese seafarers find the Americas?